You probably wouldn’t expect an innovative app to come from a mobile operator, and if it did you’d probably expect it to be exclusive to customers of that operator’s network. ON Voicefeed, from Orange Vallée, the research and development department at France Telecom’s Orange Group, flies in the face of conventional expectations by actually being rather good, and open for anyone to use. This iPhone app is billed as ‘Smarter voicemail’, and is best thought of as a turbo-charged version of Apple’s own Visual Voicemail. It’s just been updated with a range of UI tweaks, so I took the opportunity to take it for a spin. 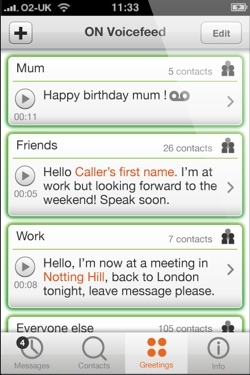 ON Voicefeed lets you set personalised voicemail greetings for when different people, or groups of people, call you. These can either be recorded as audio or entered as text, in which case an automated voice will read out the message when people call, even personalising the message with their own full name or first name if they’re in your address book. Twitter and Facebook integration means that you can get the automated voice to read out your latest status update to your callers. I set the service up to read out my Facebook status, which sounded great – except that it pronounced the word “Nice” as if I was talking about the French city of that name – “Neece“. Well, Orange is a French company, I suppose. A range of voices are available to select from to read your greetings out to callers. You can also tag greetings with your current location, either the exact address, at city level or country level. Managing received voicemails is simple. It works like Apple’s Visual Voicemail, with the ability to play back messages in any order you like. However, you additionally get an email notification to let you know you’ve received a message even if you’re away from your phone. There’s optional voicemail transcription, which turns the messages you receive into text, although this beta feature is accompanied by a warning that a human may have to listen to your message to ensure that it’s transcribed correctly. When trying the feature, we got mixed results, with some words and messages coming out fine and others turning out garbled. As with any voice-to-text service that transcribes messages spoken down a phone line, this is to be expected. ON Voicefeed is available as a free app, or as a premium offering for the nominal fee of ¢9.99 / £6.99 (or local equivalent) per year. This throws in an unlimited number of customized greetings (you can otherwise only have three); a greater choice of voices to read your automated greetings; unlimited storage duration of all your voicemails, and voicemail recordings sent to your email address as MP3s for added convenience. Setting the app up is a painless experience. You enter details like your phone number and mobile operator, let it automatically change your iPhone’s voicemail settings (it’s easy to change them back, too) and you’re ready to go. The latest version of the app, which has just been released, mainly consists of UI tweaks to make the app easier to interact with, and further updates are planned to arrive regularly. That a mobile operator is offering an app like this to anyone seems to show that Orange understands that the future role of its kind of company is very much undecided – so why not try developing an app and see how it goes? Our testing of the app left us impressed. There are some things Orange can work on to improve the overall user experience, but in terms of features, this is a worthwhile alternative to the standard voicemail that comes with your iPhone.